Chip Ganassi Racing’s Scott Dixon will start this weekend’s IndyCar Series race from the pole. 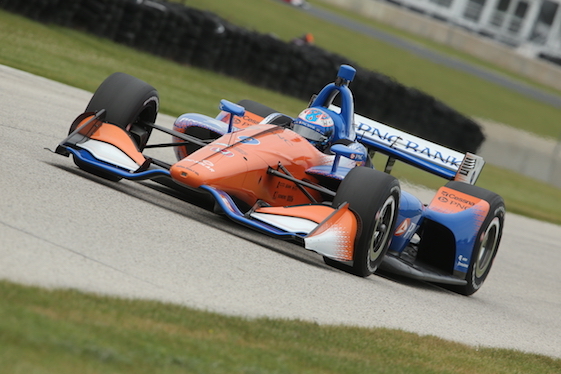 Verizon IndyCar Series championship leader Scott Dixon will start on-pole after the field was set by entrant points for Saturday night’s Bommarito Automotive Group 500 presented by Axalta & Valvoline. Verizon P1 Award qualifying was canceled Friday afternoon at Gateway Motorsports Park in Madison, Ill., after periodic rain throughout the day in the St. Louis metro region played havoc with the track schedule. Two practice sessions were completed on the 1.25-mile oval. But the first yielded just 22 minutes of green-flag time, leading INDYCAR officials to forego the qualifying session in favor of a longer final practice to allow teams more time to set up their cars for the race. Per INDYCAR rules, the 21-car starting grid was set by entrant points. That put Dixon, the four-time series champion from Chip Ganassi Racing, on the inside of Row 1 for the 15th of 17 races on the 2018 schedule. Also per INDYCAR rules, however, Dixon was not credited with a pole and did not earn a bonus point _ keeping his lead at 29 points over Alexander Rossi of Andretti Autosport heading into an event scheduled for 248 laps/ 310 miles. “I think, ultimately, everybody wants to qualify,” said Dixon, driver of the No. 9 Honda. “In many ways, I think INDYCAR made the right decision as far as trying to put a priority on getting some running (in final practice)…that will benefit everybody for race setup and that kind of stuff later on. It was going to be hard, I think, schedule-wise to try to get everything in. Rossi will start second in the No. 27 Honda. Rossi was fastest in both practices, his lap of 184.424 mph around the 1.25-mile layout in the first session holding up as best of the day. Rossi has won the last two races _ at Mid-Ohio Sports Car Course in Lexington, Ohio, on July 29 and Pocono (Pa.) Raceway last Sunday _ to slice Dixon’s point lead by more than half. Reigning series champion/defending event winner Josef Newgarden of Team Penske sits third, 66 points behind Dixon, while reigning Indianapolis 500 champ Will Power of Team Penske is fourth, 81 points out. In addition to those four, six other drivers remain mathematically eligible for the 2018 championship: Ryan Hunter-Reay of Andretti Autosport; sidelined rookie Robert Wickens of Schmidt Peterson Motorsports; Simon Pagenaud of Team Penske; Graham Rahal of Rahal Letterman Lanigan Racing; James Hinchcliffe of SPM and Sebastien Bourdais of Dale Coyne Racing. Any driver who trails the championship leader by 159 points or more following the race will be eliminated from contention. “Last year was our first year back (to Gateway),” said Newgarden, driver of the No. 1 Team Penske Chevrolet. “It was a new track surface. It hasn’t changed much, which is good. The track is not that different from a ride characteristic or really a grip standpoint. It seems similar to last year. It’s just the (universal Dallara) aero kit change that’s vastly different. So we’re trying to figure that out. Since the first Indy car race at Gateway Motorsports Park in 1997, only Alex Zanardi (1998) and Newgarden (2017) have won this race and the championship during the same season. NBC Sports Network will air a delayed recap of Friday’s final practice at 6:30 p.m. (EDT) Saturday, ahead of the live race coverage that begins at 8 p.m. on the network and the Advance Auto Parts INDYCAR Radio Network. Schmidt Peterson Motorsports driver Robert Wickens continues to be treated at Lehigh Valley Hospital- Cedar Crest in Allentown, Pa., for injuries sustained during last Sunday’s INDYCAR event at Pocono Raceway. Surgeries were performed late this week on his right arm and lower extremities without complication. The extent of his spinal cord injury remains indeterminate. Wickens also underwent a series of precautionary tests that found no indication of further injury. Late Monday, Wickens underwent surgery to stabilize a thoracic spinal fracture associated with a spinal cord injury sustained in the crash involving Ryan Hunter-Reay of Andretti Autosport on Lap 7 of the 200-lapper. Titanium rods and screws successfully were placed in Wickens’ spine during the surgery, which was performed without complication. Wickens, a 29-year-old Canadian and series rookie, was injured in a violent multiple-car crash on Lap 7 of the ABC Supply 500 on Pocono’s 2.5-mile “Tricky Triangle” layout in Long Pond, Pa. Future treatment for Wickens includes more corrective surgery and rehabilitation. SPM is competing this weekend with only one Honda-powered car, as the team continues to regroup following Wickens’ crash.“A bit of a tough day here at Gateway,” said lead driver James Hinchcliffe, Wickens’ fellow-Canadian. “The track here drives a lot different than a year ago with the aero kit the way it is. Unfortunately, we didn’t get to test here, and after today, we’re really wishing that we had. I think we had decent one-lap pace, but obviously with qualifying being canceled, we start on points. It is what it is. Verizon IndyCar Series top-10 point standings _ 1, Scott Dixon, Chip Ganassi Racing, 530; 2, Alexander Rossi, Andretti Autosport, 501; 3, Josef Newgarden, Team Penske, 464; 4, Will Power, Team Penske, 449; 5, Ryan Hunter-Reay, Andretti Autosport, 411; 6, Robert Wickens, Schmidt Peterson Motorsports, 391; 7, Simon Pagenaud, Team Penske, 368; 8, Graham Rahal, Rahal Letterman Lanigan Racing, 351; 9, James Hinchcliffe, Schmidt Peterson Motorsports, 338; 10, Sebastien Bourdais, Dale Coyne Racing, 325.